With my newfound appreciation for the Federal Duck Stamp contest, here’s a report from the U.S. Fish and Wildlife Service’s Pacific Southwest Region on the California Junior Duck Stamp contest. Held annually by the Service’s Sacramento National Wildlife Refuge Complex, the Federal Junior Duck Stamp Program showcases the incredible waterfowl artwork created by students from kindergarten through 12th grade from across California. This year, the judges analyzed a staggering 2,276 entries. 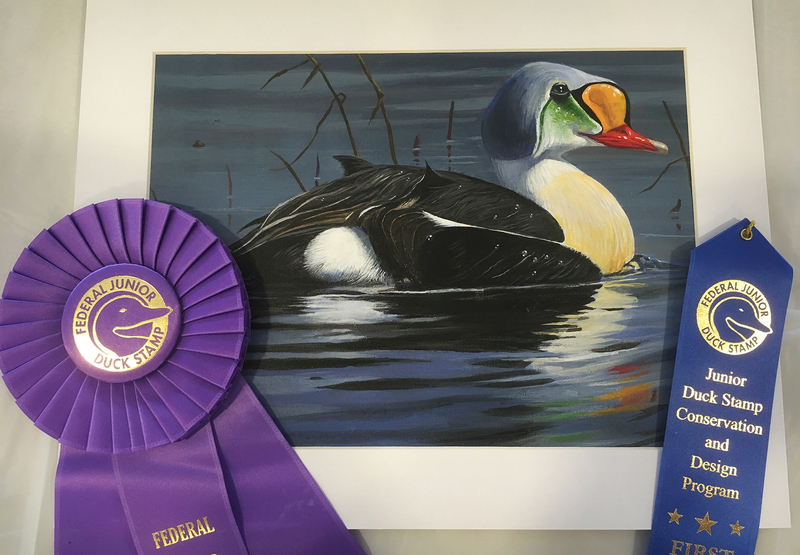 A realistic acrylic painting of a king eider by Sue Yeon Park, age 17, Rancho Palos Verdes, made the 2017 Best of Show for California. Her artwork will be submitted to Washington D.C. to compete with the other states’ Best of Show winners during the National Junior Duck Stamp Design Contest on April 21, 2017. The national winner’s design will be made into the 2017-2018 Federal Junior Duck Stamp. “I think what’s most amazing is that you have so many kids who care about conservation,” said Paul Souza, Pacific Southwest regional director. “I was amazed by how advanced their thinking was about the interconnection of ecosystems and wildlife and people and habitats. There’s just a clear understanding of the linkages of a healthy environment.